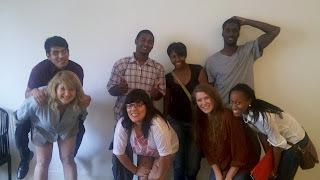 This past Wednesday we hosted a Student Career Alternatives Program to discuss youth programs this summer. It seems like we had all the rights folks, and just the right amount of excitement in the room. There were a lot of great ideas put out there by high school aged youth as to how we might engage young people this summer. For now we're moving forward with planning a series of youth events, the first one being on June 23rd, all leading up to an August "Be The Change" youth convergence. We'll be meeting every Wednesday from now on for a potluck meetings to bring in new folks and plan next steps, and you're invited! 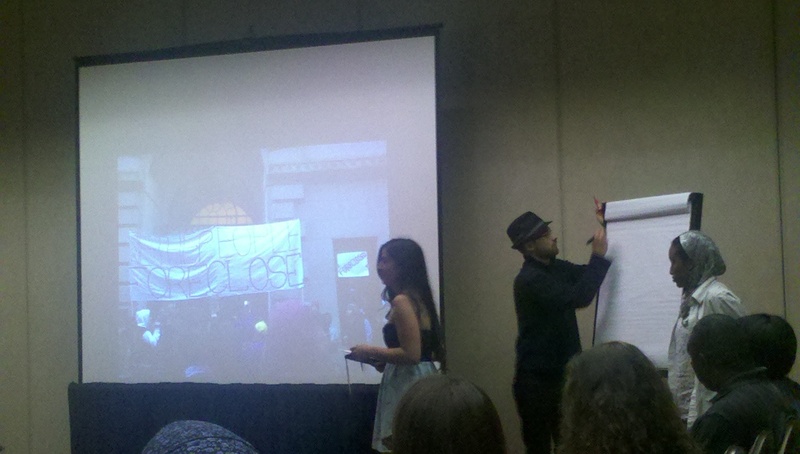 Mad Props To Dejah and Marc!! 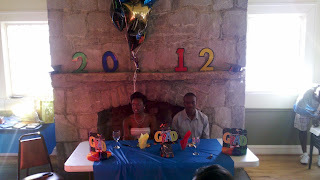 This past week Dejah Ault and Marc Pongnon graduated from high school. Both Marc and Dejah have been key organizers with AFSC's Student Career Alternatives Program(SCAP), they also both participated in SCAP's college prep and SAT tutoring program, and they both helped organize last year's Be The Change Youth Convergence. Over the past four years it's been really exciting to watch Dejah and Marc grow as both human beings and community organizers. 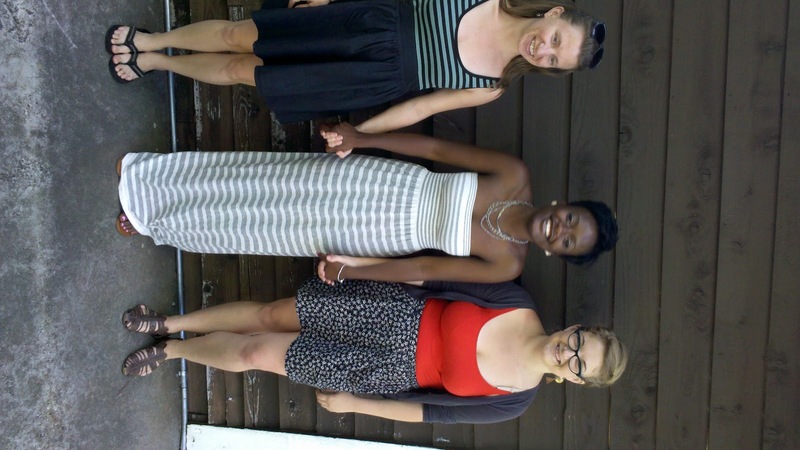 Last summer Dejah was granted a summer internship with AFSC and spent her time organizing youth in our Be The Change Crew. Dejah's outgoing, glowing personality made her a perfect fit for a role the required a lot of presentations, creative outreach, and leading teen workshops on social justice work. 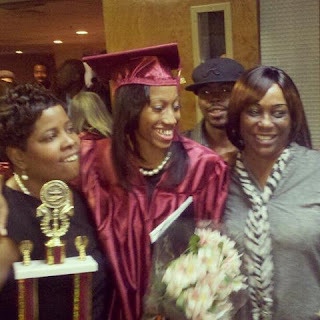 Dejah plans to attend Spellman and has been award the Gates-Millennium Foundation scholarship! The Gates-Millennium Foundation scholarship is basically a full ride all the way to a PHD! Way to go Dejah! Marc got involved with AFSC during our campaign to stop the HOPE scholarship cuts last year and after just a few days ended up writing and giving a very profound speech during a press conference that clearly articulated the connection between a bloated military budget and education cuts. Marc stayed very active with SCAP ever since. Marc has received a scholarship to the University of New Haven, based on an essay he wrote about his experience organizing with AFSC. Our hats are off the Dejah and Marc, we're so proud of both of you! 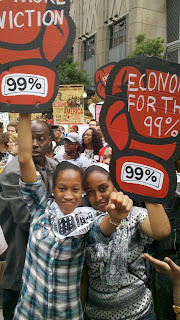 No doubt that ya'll will continue to be the change our communities need! Today, after a lot of hard work, Carmen Pittman received her diploma from BaSix Knowledge Academy. Several activists who have been fighting alongside Carmen joined her family for the ceremony at Ray of Hope Christian Church in Decatur, Ga. While we were all very proud of Carmen's accomplishment none of us, including Carmen, knew that she was to be honored for advocacy in the community. 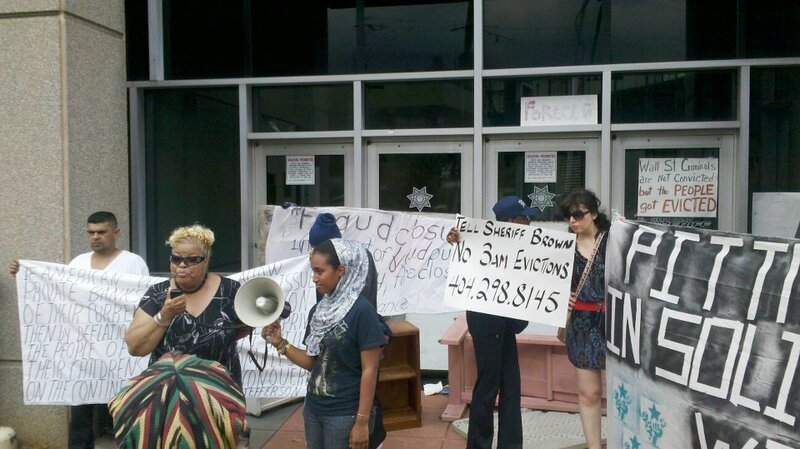 Over the course of the last six months Carmen has not only become a spokesperson for her families struggle against Chase Bank, she's become a spokes person for for thousands of people facing foreclosures and evictions in the Atlanta area. It was just six months ago that Occupy Atlanta responded to the crisis facing the Pittman family. They had not only lost their beloved Mother and Grandmother, Eloise Pittman, they found out the Chase Bank was planning on evicting the family as well. 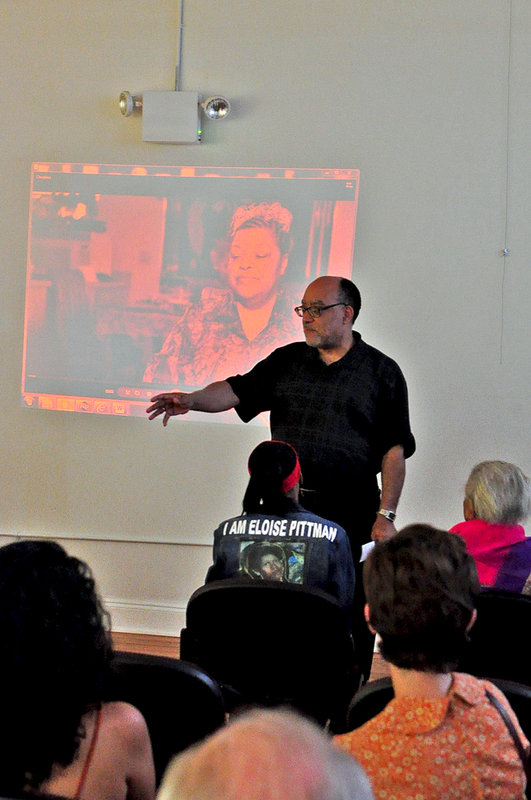 Prior to Occupy Atlanta's involvement with her families struggle, Carmen had never thought of herself as an activist or an organizer. That all changed in the weeks and months to follow. From day one Carmen expressed a desire to learn about the connections between the systems of violence oppression that control our economic system. 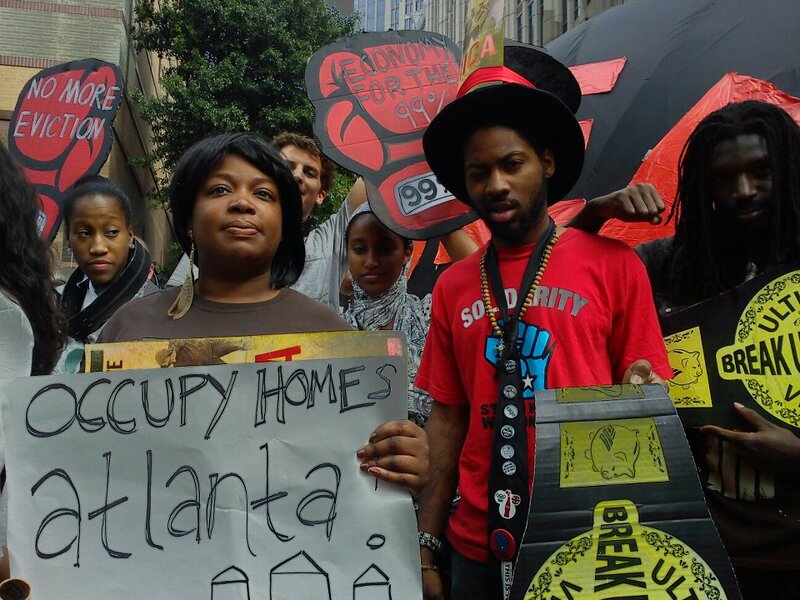 Carmen has embodied the concept that Occupy Atlanta's home defense work has tried to lift up; that we don't fight for folks, we fight with them. Carmen has come a long way from sitting in on strategy meetings and attending actions. 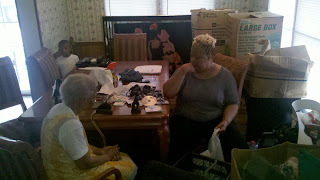 She now calls for meetings, and plays a key role in planning every aspect of the campaign to save her home. More recently Carmen has also worked with other families who are standing up to the banks. 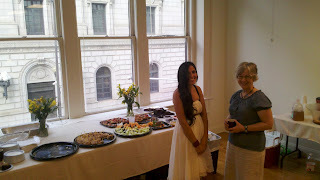 Today Carmen was awarded the Myra Jackson Pioneer Award for her outstanding activism in the community! Congratulations Carmen Pittman! 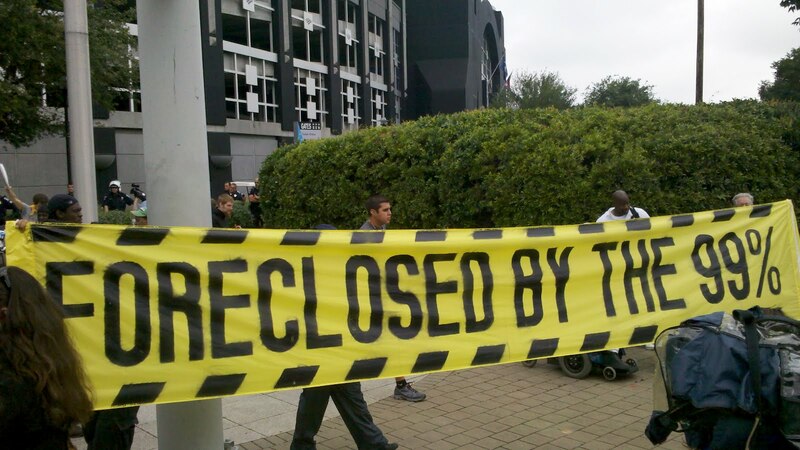 AFSC's Georgia Peace and Conflict Resolution Program has been proud to committ resources towards the campaign to stop Chase Bank from evicting the Pittman family and we're excited to see a new much need leader in Carmen Pittman! Occupy Our Homes ATL Lift Off! 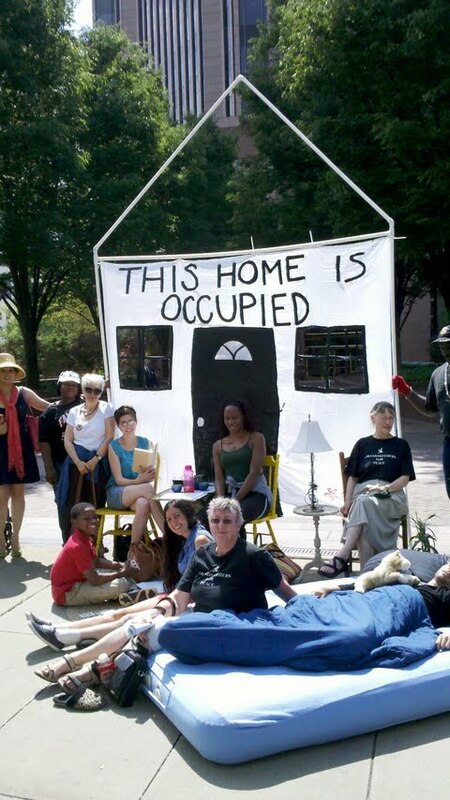 Thanks to all who made it out on Saturday for the Occupy Our Homes ATL official launch, a project that's very close to the heart of AFSC's Georgia Peace and Conflict Resolution Program! Special thanks to Chris Frazer, Bridgette Walker, Carmen Pittman, Pastor Dexter Johnson of Higher Ground Empowerment Center, and Pamela Flores for sharing their victories and struggles; to Senator Vincent Fort and Tony Romano of Right to the City Alliance for their inspiring messages of support; to folks who donated to and participated in our silent auction; to Altobeli's for the wonderful food; and to all who pledged to defend homes in the metro-Area! 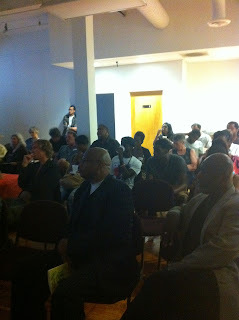 "Over $7,000 was pledged at the event to help us with start-up expenses and initial program costs. Our goal was to have $10,000 pledged, so we are hoping to make up the difference by extending our initial push pledges one more week. By June 1st--the same day that we will move into our new communal home and headquarters--we hope to have $10,000 pledged. If you were unable to pledge your solidarity and financial support at our launch, please consider donating here. You will notice that over the course of our first year we are aiming to raise $28,000 through local, grassroots support. While this initially might strike ya'll as an overly ambitious fundraising goal, we want to assure folks that we've been very thoughtful and intentional about this goal and its use. As a budding community organization with large, transformative demands to change the way our city approaches housing, we recognize that there are many resources that we need in order to not only defend homeowners and tenants from foreclosure and eviction on a mass scale, but also to strive toward a total sea change in our city's approach to housing. While there are many resources that would certainly make our work more effective, we recognize that the resources we cannot do without are committed, accountable, full-time activists. As we moves forward with our plans, we now--perhaps more than ever--hope to make it clear that we are working under the banner of the Occupy Movement. 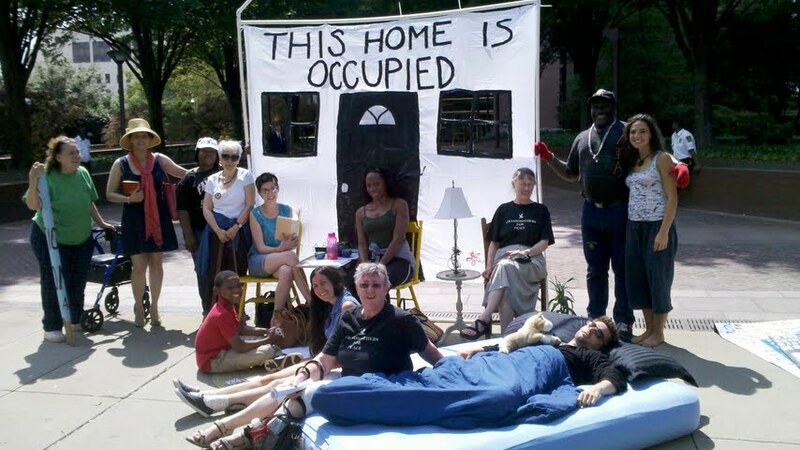 While we will not be accountable to the GA's, but rather accountable to each other and our communities, we do recognize the contradiction of Occupy activists receiving stipends from large foundations and from the 1%. Because of this, we are aiming to support our four full-time activists solely through grassroots fundraising. 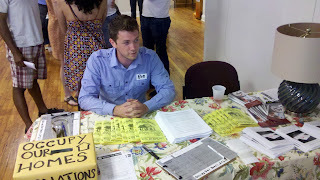 Please consider donating to support our activists today." We look forward to updating everyone on OOHA's developments soon. 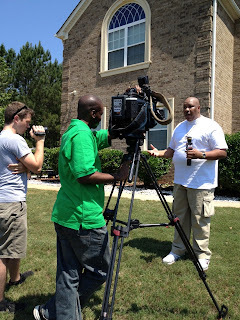 Stay tuned for more information about our summer Home Defense Mobilizing Conferences. AFSC's Georgia Peace and Conflict Resolution Program aims to continue to support this important movement with trainings, resources, and space for meetings and conferences. Our cities housing crisis is unprecedented and requires unprecedented, bold, nonviolent, creative action. 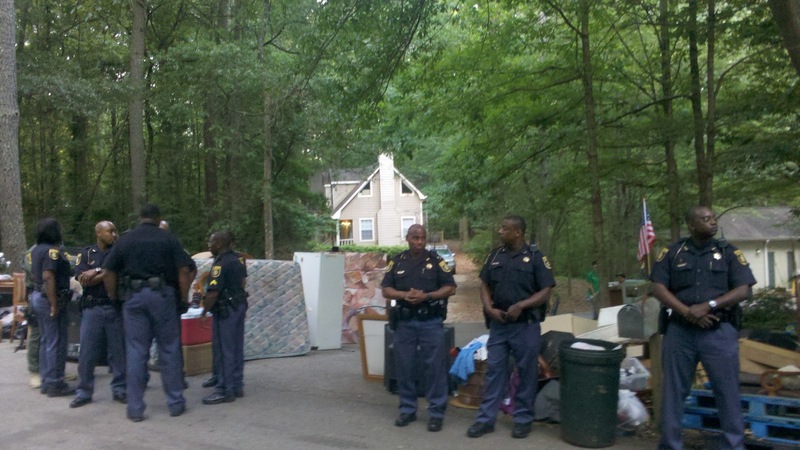 Newton County resident Eddie Jones was illegally evicted on Thursday, May 17th. Instead of just rolling over and letting his house get taken away like so many other Americans, Eddie decided to fight back. Eddie got a few friends together and did something very few have been brave enough to do—he moved back into his home. 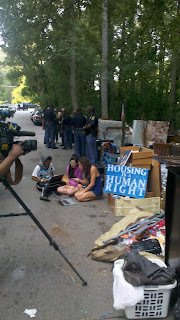 This past Saturday, Sheriff’s deputies showed up at Eddie’s home to evict him. 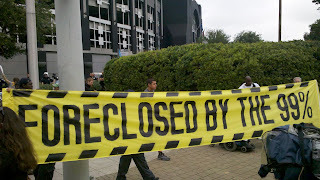 After allowing Eddie to show them paperwork that proves his foreclosure--and therefore eviction--is wrongful, the officers decided to leave and give Jones until Monday, May 21st to vacate his home. 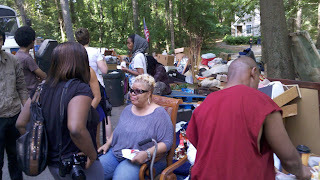 Former Congress Woman Cynthia McKinney, who Eddie used to work for as a body guard while she was in office, contacted Occupy Our Homes ATL(OOHA) this past Saturday with a sense of urgency. OOHA sprung into action and planned a press conference for Monday morning, the same time Eddie's 2nd eviction was scheduled. As we were mobilizing folks the Sheriff of Newton county was contacted and informed that Eddies case was rife with fraud, and that the community would push back if there was an eviction attempt. At the press conference, which was also a soft blockade against Eddie's eviction, we were joined by Vison Jones of National Action Network, Cynthia McKinney, Civil Rights leader Joe Beasley, and members of Newton County SCLC. More on Eddie Jones’s fight to save his home. Mr. Jones suffered from a car wreck in 2008 and missed three payments on his mortgage, which caused him to spiral into foreclosure. 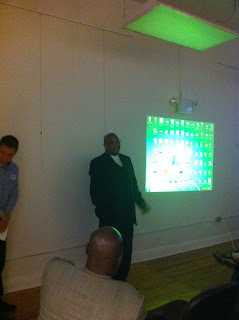 He applied for the Making Home Affordable program and was accepted. After making three payments in full and on time Mr. Jones was mysteriously dropped from the program. 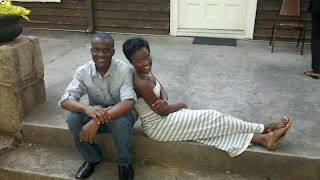 His home was then transferred over the Internet via MERS from Litton Loan Servicing to Fannie Mae. He has a copy of the MERS transfer of the property to the evicting party, Fannie Mae, which is under a cloud of legal suspicion and may not have standing in Georgia Courts. Mr. Jones’s home was fraudulently obtained by Fannie Mae through MERS (Mortgage Electronic Registration Systems), which was deemed by Courts throughout the country as not having any ownership interest in any mortgage. He has a case pending before Newton County Court, #2012978-5. 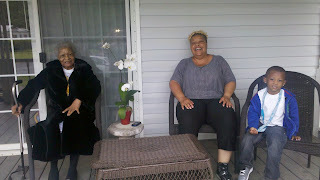 Today, on Mothers Day, several of us came out to visit Chris Frazer, her mom Daisy, and Grandson Malachi at their new house, which is temporary. We brought Mothers Day flowers and offered our labor as there's still much moving around that needs to be done. It's been just over a week since the Frazer family was evicted at gunpoint by Sheriff Thomas Brown and 40 of his officers at 3am. The trauma that the unprecedented action caused the Frazer family undeniably lingers strong. It was a tough scene to observe for anyone, but one can only imagine what it's like having you doors knocked in, physically forced out, and see all you belongings carelessly tossed onto the lawn. Given the circumstances the Frazer family is making the best of the situation. The family's first priority was getting everyone under the same roof again. 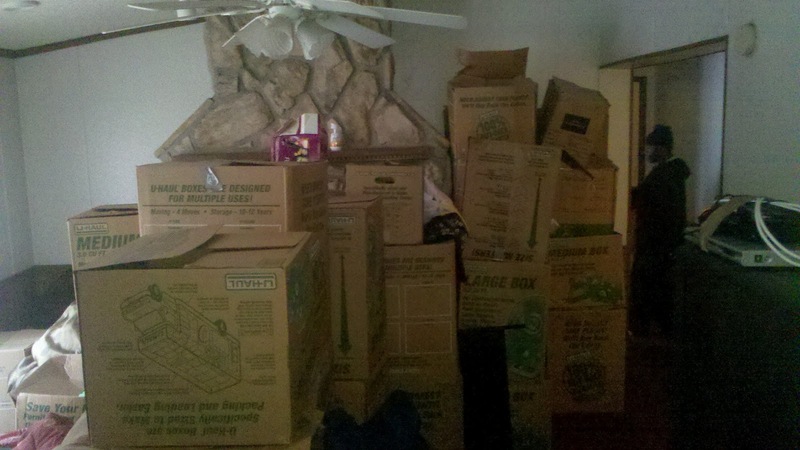 The unexpected move has brought many expenses, from moving trucks, movers, broken and damaged property, first and last months rent, and turning on new utilities, the Frazers money is stretched very thin. We've set up a wepay account that goes directly into Chris Frazers account. Our hope is to get at least 2,500 by the end of the week, can you help? 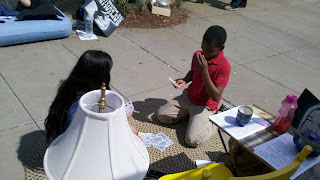 This Thursday(5/17) at 7:30pm there will be a candlelight vigil in front of the home(3662 wellhaun rd, Decatur) Chris Frazer's family was evicted from in the middle of the night at 3am. 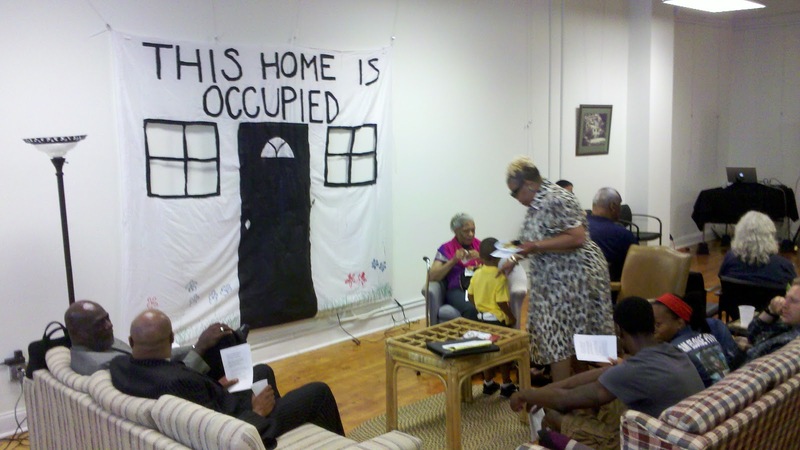 We invite all who are concerned with foreclosures, evictions, and housing in general to stand with Chris Frazer and her family. The day after the annual Bank of America shareholders meeting around a dozen of us Atlanta folks stuck around to participate in a national urban summit to address the unprecedented housing crisis. Occupy Our Homes, Atlanta(OOHA), which AFSC has put a lot of time and energy supporting, was a front and center group at the Congress. 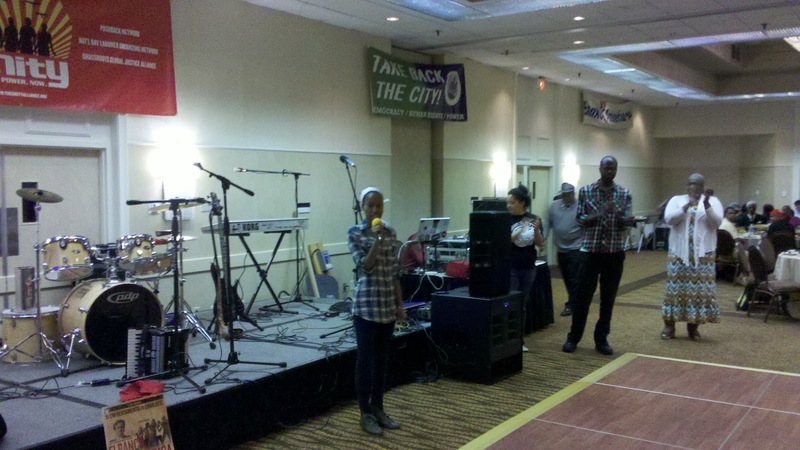 The event was organized by the Unity Coalition which is a grouping of several national coalitions including Right to the City, and Jobs With Justice. 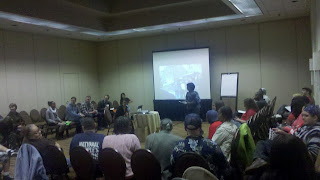 OOHA had an opportunity to present their home defense/community building model to hundreds of folks, and more importantly OOha had the chance to learn from folks that have been engaged in this work for many years. Conversations about how to bring the creative, bold, fearless occupy tactic together with good old fashion community organizing went late into the night. Though the housing crisis is a nightmare, it's clear that from the ashes of it there's great potential to change our communities approach to housing, to lift housing up as a human right, to build the communities we want to live in. *They’ve drained seniors of their retirement and savings by selling crap mortgages disguised as highly rated investments to unions and pension funds. *They’ve diverted millions of dollars that would have been spent on building schools and education by scamming local municipalities out of fees and mismanaging their money. *They popularized the term “robo-signing”-a practice that involves forging court documents in order to illegally foreclose on properties they had no claim to. *They knowingly pushed African Americans and other minorities into risky sub-prime loans, while giving white non-minorities of the exact same financial status stable prime loans. *An overwhelming 40% of their loans have been shown to have income overstated by the lender, trapping people in loans they knew couldn’t be repaid. *They implemented systems to charge bogus overdraft fees to their checking account customers, and even take advantage of the unemployed by charging massive fees to people trying to access their benefits. This is all after receiving billions of dollars in tax-payer funded bailouts and debt guarantees from the federal government. *Bank of America paid $0 in taxes last year, and even received a $1billion refund-- money they turned around and used to pay out over $35billion in bonuses to their executives. 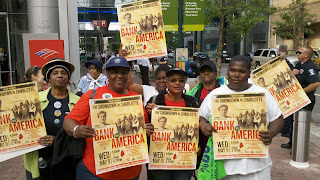 So there's no mystery as to why so many can so far to turn BofA's shareholders meeting into an opportunity to share with the world the many ways in which BofA disrespects our communities. 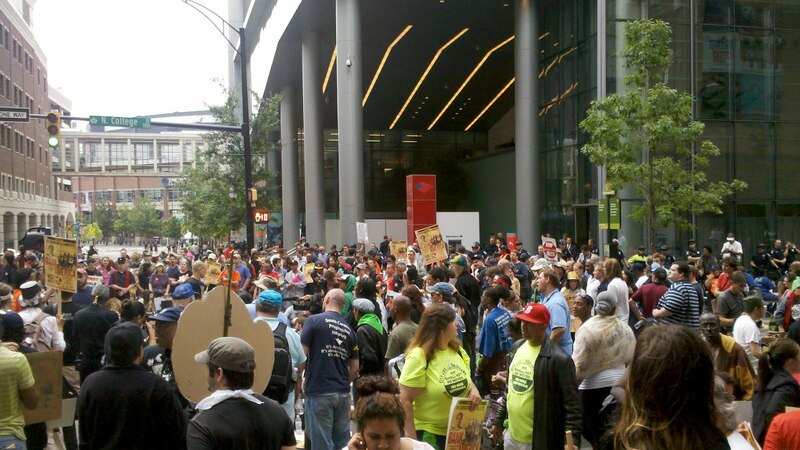 Three separate marches converged at BofA's headquarters just before the scheduled shareholders meeting. Each feeder march focused on a different issue, one on corporate greed, one on housing, and one one the environment(BofA has sunk billions into the coal industry). One at the shareholders meeting, around 1,000 people took the streets and refused to leave. 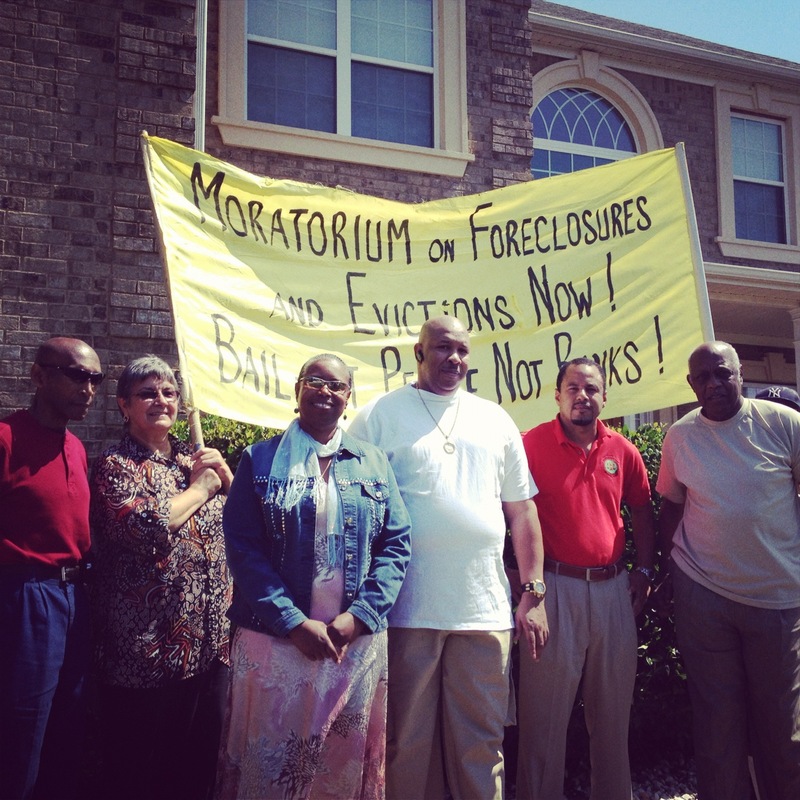 Homeowners in the foreclosure and eviction process at the hands of BofA spoke out, as did many others effected by BofA practices. Over 100 activists and folks being negatively impacted by BofA made it inside the shareholders meeting. It was reported the Brian Moyniham was visibly shaken by the ruckus caused in the shareholders meeting, in fact folks said his voice was cracking and eyes wear watering, that he had no idea how to respond to the overwhelming opposition expressed in the shareholders meeting. 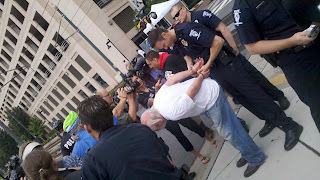 Right as the shareholders meeting began several homeowners being foreclosed on by BofA attempted to enter the meeting and when private security refused to allow them in police where called in. The four were arrested for refusing to leave the area. It wasn't only BofA's financial stock that took a hit this week,their moral stock took a dive as the BofA shareholders meeting made over 1,000 media hits, most of which painted BofA in a pretty negative light, which they have certainly earned. 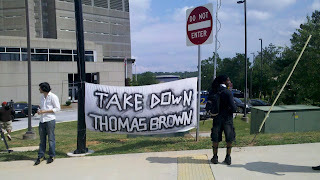 Occupy Atlanta and community allies organized a rally outside of Sheriff Thomas Browns office at 4415 Memorial Drive today. Over 100 people showed up with signs and carrying some of the wreckage that Sheriff Brown and his officers left in Chris Frazer's lawn less than a week ago. 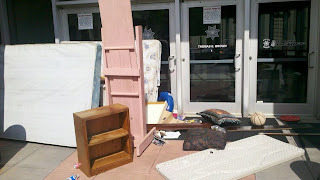 The furniture was place in front the entrance to the Sheriff's department with the idea of bring the housing crisis right to the Sheriff's doorstep. 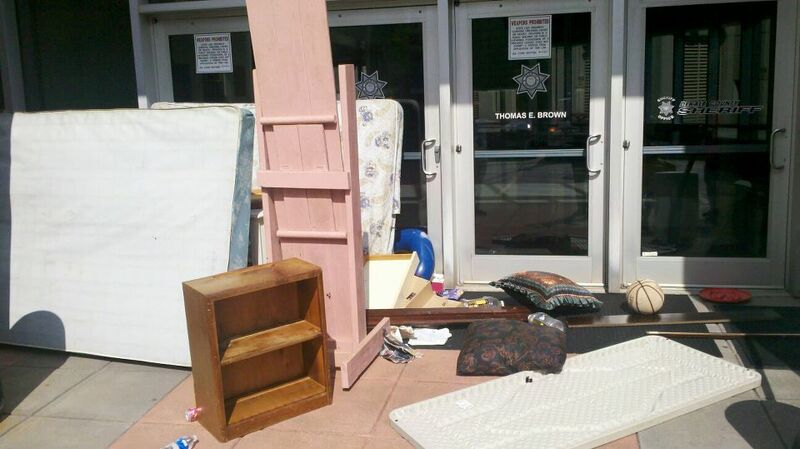 The Sheriff's office locked the door and refused to respond to community concerns. Chris Frazer, Carmen Pittman, and Pastor Johnson all spoke to the crowd outside of the Sheriffs department demanding that Sheriff Brown apologize and let Chris Frazer back in her home. 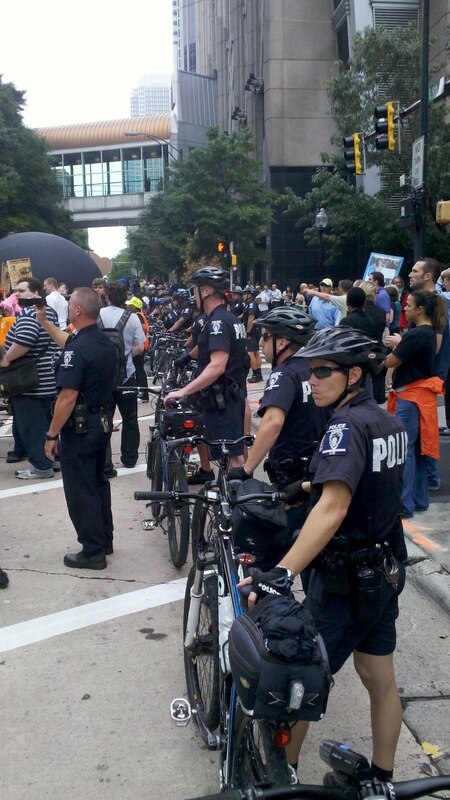 After the demonstration Dekalb Sheriff Officers pulled over one of the lead organizers for no reason,threatened anyone who attempted to film the scene, impounded the vehicle, and cuffed an activists that refused to stop recorded Sheriff Browns officers as they obstructed the law. Later that activist was taken to Grady hospital for injuries and released from custody. Chris’ house was foreclosed on fraudulently by Investors One Corporation in October 2011, and she a case currently in federal court disputing the foreclosure. In March, activists with Occupy Atlanta set up camp on her lawn and committed to stay to defend Chris’ home from eviction. 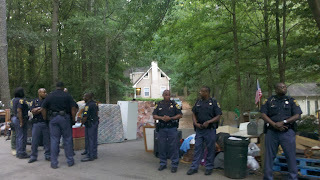 Using what sheriff Thomas Brown himself referred to as “intelligence,” Dekalb County law enforcement waited until activists were not present at the home, and the neighbors would be asleep, to serve an unprecedented eviction after hours, putting 4 generations including her 85 year old mother, and 3 year old grandson out on the curb. They refused to allow Chris to shower or for her mother to get dressed; they told Chris to behave as if it were a fire drill. They even rounded up her dogs and took them to the pound. The police blockaded the neighborhood and wouldn’t allow anyone to help secure the family’s valuable personal belongings from the side of the road, and they stole many of Chris’s valuables. Once again, it is clear that the government and our law enforcement officials are being used to serve and protect the interest of the 1% and not of ordinary people or even the laws that they have put in place. 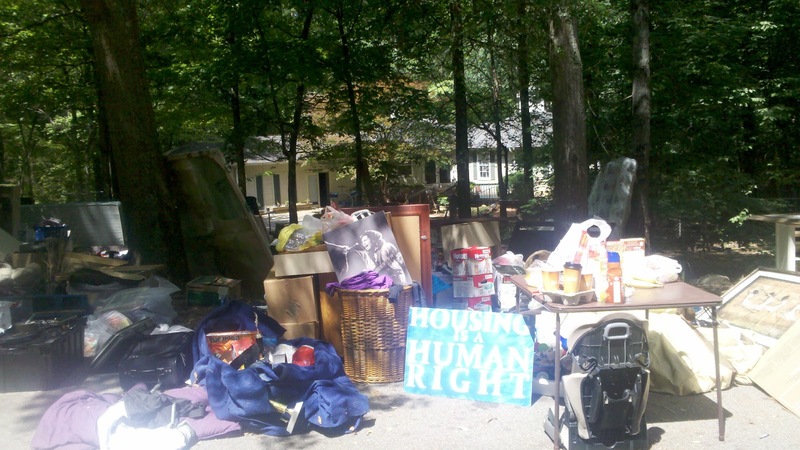 Occupy Atlanta and community allies are more committed than ever to the fight for Chris Frazer’s home, and the thousands of other homeowners just like her who are being disrespected every day. We cannot afford to allow Sheriff Thomas Brown to disrespect are communities in this fashion. We demand that he lets the family back into the place they've called home for the past 18 yrs. We will be meeting outside of his office Monday evening, 4-6pm, carrying signs and banners asking why he would choose to leave a family homeless at 3 in the morning at gun point and allowed her valuables to be stolen. defend Chris’ home from eviction. family’s valuable personal belongings from the side of the road. her who are being disrespected every day. their true colors today, and made it known where their loyalties lie. let them know that we will not stand for this type of shady behavior. Watch this powerful video to see Christine's story. the dogs out of the pound. Please donate to help in anyway you can. Bank of America has made a habit of kicking folks out of their homes illegally. 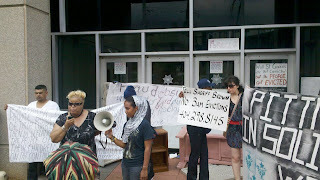 Since most people have no place else to go, today Atlanta community members decided to move in to the Bank. There was one simple demand. MAKE A DEAL TO KEEP PAMELA FLORES IN HER HOME!! Bank of America is at it again! The “Too-Crooked-To-Fail” megabank-- notorious for ripping off everyone from investors and insurers, to homeowners and the unemployed-- is after Vine City resident, Pamela Flores’ home. BoA is attempting to foreclose on Pamela’s home, claiming that she missed payments during the trial period of a loan modification she received through the “Making Homes Affordable” program. The thing is, Pamela never missed a payment and has the records to prove it. Instead of investigating her case and admitting their error, the bank is moving forward with plans to foreclose. Trying to steal Pamela’s home is hardly Bank of America’s first offense. Their crimes are vast, and their greed is immeasurable. They’ve drained seniors of their retirement and savings by selling crap mortgages disguised as highly rated investments to unions and pension funds. They’ve diverted millions of dollars that would have been spent on building schools and education by scamming local municipalities out of fees and mismanaging their money. They popularized the term “robo-signing”-a practice that involves forging court documents in order to illegally foreclose on properties they had no claim to. 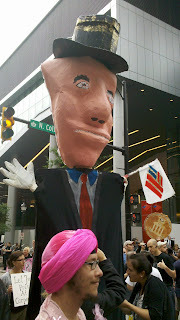 Bank of America is also racist. They knowingly pushed African Americans and other minorities into risky sub-prime loans, while giving white non-minorities of the exact same financial status stable prime loans. An overwhelming 40% of their loans have been shown to have income overstated by the lender, trapping people in loans they knew couldn’t be repaid. They implemented systems to charge bogus overdraft fees to their checking account customers, and even take advantage of the unemployed by charging massive fees to people trying to access their benefits. This is all after receiving billions of dollars in tax-payer funded bailouts and debt guarantees from the federal government. Bank of America paid $0 in taxes last year, and even received a $1billion refund-- money they turned around and used to pay out over $35billion in bonuses to their executives.